A series to learn about the various ways your neighbors come together in groups large and small to create community. If you have an idea for a group to feature, email correspondent Judith Spitzer at jaspitzer31@mac.com. The Literary Freedom Book Group meets on the last Wednesday of the month at 6 p.m. at Auntie’s Bookstore downtown. The word “bibliophile” – a noun describing a person who loves or collects books – fits Linda Bond to a T.
If something “fits to a T,” then it’s perfect for its purpose. And Bond, who works at Auntie’s Bookstore, loves words that fit perfectly. As the book club coordinator for the store, Bond said book clubs are experiencing a resurgence … again. Bond is the leader of the Inland NW Writers Guild and a “lightly published” author. She facilitates a plethora of book clubs, both in the store and out, including one called the Literary Freedom Book Group. The Literary Freedom group has a long history at the store, but over the past two years it has grown to a core of about five people, and “other drop-in readers who are interested in specific books” on the annual list of 12 works. Bond and her friend, Sue Keehnen, are founding members of the group. Keehnen organizes the book list for the year after input from the members, and provides questions for the particular book the group is reading. Keehnen also qualifies as a bibliophile. “I have a couple of rooms full of books and I always hope for a snow day so I can just sit and read,” Keehnen said. Last month, the group read and discussed “All the Light We Cannot See,” by Anthony Doerr. Up next for May is “The Tiger’s Wife” by Tea Obreht. Chelsea Wason, a member of the group for almost two years, said it was actually the list of book titles that pulled her into the group. Wason said she never would have just picked up some of the books the group has chosen to read on her own. “That was part of why I wanted to join a book club as well, is that I was starting to get very set in what I liked to read. And I wanted to push beyond that and get in touch with things that other people liked to read,” she said. In the past, Wason said she read quick-and-easy books, such as “The Hunger Games” series. “And now, what the book club has gotten me into are more like established authors. Wason said meetings are part social, part book discussion. She said it’s even helped her every-night “Jeopardy” habit. Bond said she’s seen a resurgence in book groups over the past couple years and theorizes that perhaps people are tiring of technology-based pursuits and are getting back to quieter pursuits. “I don’t know exactly what the impetus is but I think there’s been a hunger to get some other things back that are not technology centered. And to be able to actually talk to other people,” Bond said. Bond said many of Auntie’s book clubs’ choices are taken from a list of indie best-sellers based on the American Booksellers Association. “The ABA list is based on what members are reading from all the independent bookstores,” she said. Bond, who also reviews books for the ABA and Publisher’s Weekly, said people love the opportunity to get together and share what they’ve read. And what if group members don’t like the assigned book? Keehnen said she won’t read nonfiction books, and whether someone likes a book or not, it’s up to the individual member whether they attend and participate in the discussion. Wason said she vehemently did not like one of the books on a previous list: “Ship of Fools” by Richard Paul Russo. “I hated it,” she said. “It was long and it was terrible. Everybody hated it.” Still, she says she made a commitment to read it and pushed herself to finish it. Book groups are known to have existed in the United States since the 17th century, focusing on religious texts until after the Civil War, when secular women’s book clubs became popular, according to scholars. A resurgence of book groups was sparked by Oprah Winfrey’s incorporation of a book club into her daytime television show in 1996. 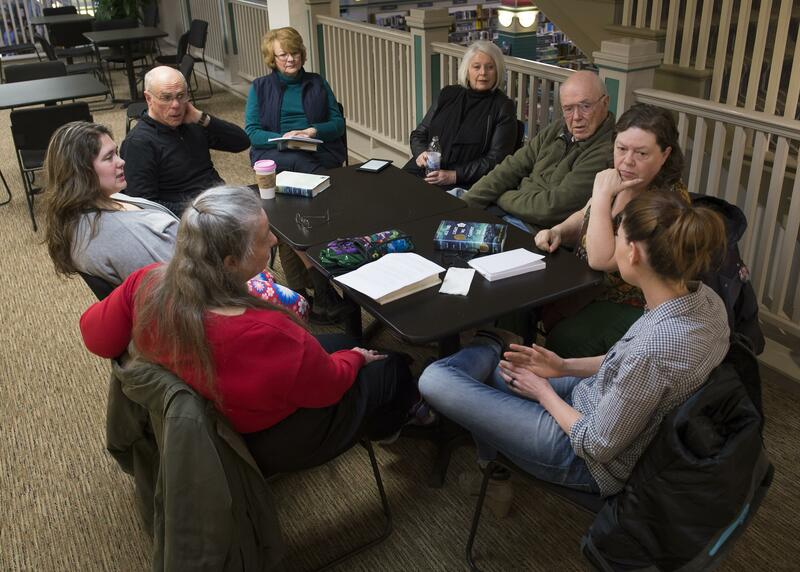 The Literary Freedom group is one of four official Auntie’s Bookstore groups that meet each month, including a lunch hour group that has just started. There are other unofficial book groups that meet at the store as well. Whether or not you read the current book on the list, Bond said, everyone is welcome to attend and talk about the book at hand.